The latest video from the “Find Your Water” series follows anglers Ben Kraushaar and Anna Ortega on a trek into Colorado’s San Juan Mountains to fish some high-country lakes for stunning . . .
Here’s part six in the video series “Getting Your Dog Ready for Hunting Season,” from The High Lonesome Ranch and Brookside Gun Dogs. Here, Steve Nicholas, head of Brookside, . . . These gorgeous Alaskan natives rose readily to a well-presented Griffith’s Gnat. Anthony and his son, Daniel, enjoyed a remarkable day in Alaska catching grayling on Griffith’s Gnats. After landing on Kijik Lake, in Lake Clark National Park and preserve, the group . . . I love these stories in which a person who certainly has the means to go out and buy an expensive pure-breed dog instead chooses to rescue one instead. In this case, it’s Cleveland Browns . . . This time of year, I see very few insects hatching on our local waters, so I almost always fish a terrestrial pattern. Foam Beetles are great because they float well, are easy to see, and . . .
I’m not quite sure who these folks at Mouche are, but they clearly know how to have a good time fly fishing in their native Quebec and they have some killer cinematography chops. This video . . . 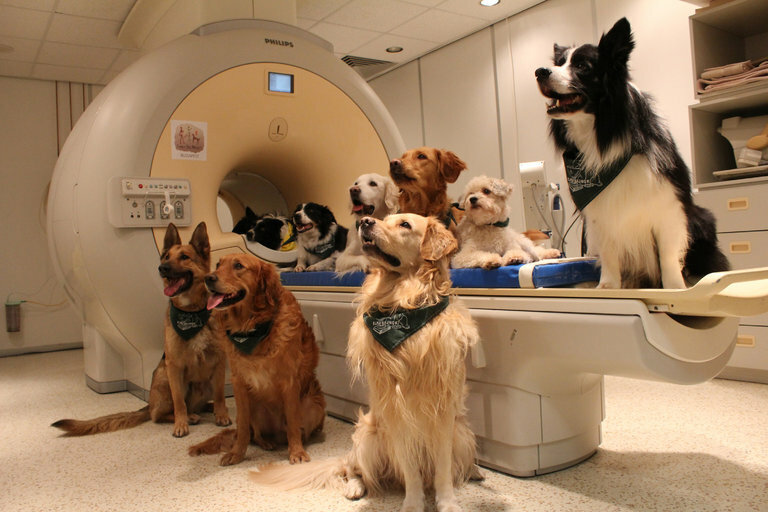 The dogs in the study pose on the MRI machine used to record brain activity. A long-running debate among those who study dogs revolves around a simple question: Do dogs understand the words we say, or is it simply how we say them? Reasearchers at . . .
Help Save the Flats of Belize’s Blackadore Caye TODAY! Extensive development of Blackadore Caye could lead to the destruction of much more flats habitat in Belize. We posted back in February about the proposed development of Blackadore Caye, in the middle of the fantastic fishery of Belize’s Chetumal Bay. Local residents and anglers—including guides . . .
Beautiful hunting scenes each side of the action. Back in May, a customer called from Pennsylvania about two guns he wanted to consign. While his 12-gauge Winchester Model 21 was in superb condition and a rare find, his 16-gauge . . .
Here’s a beautiful, heartfelt trailer for the film version of W. Bruce Cameron’s 2010 book, A Dog’s Purpose. Told from a dog’s perspective (though the narration of actor Josh Gad), it’s a story . . .